It was a day at work at Woden, but a quick trip on the frequent Blue Rapid bus got me to Civic and a percussion concert with Ensemble Evolution, DRUMatiX and, unexpectedly, Kor Phai, a Thai ensemble visiting ANU for a Thai music festival at Llewellyn Hall. How fabulous is this? 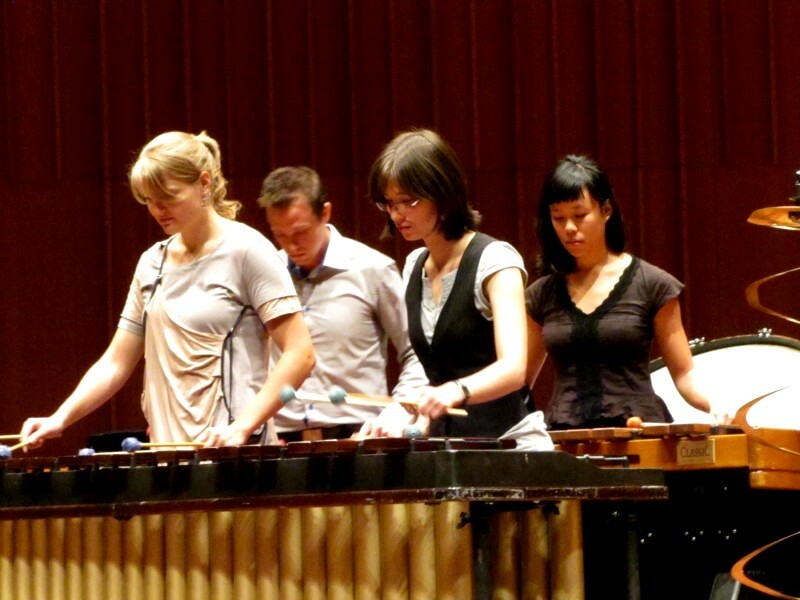 International percussionists for an intimate and free lunchtime concert. 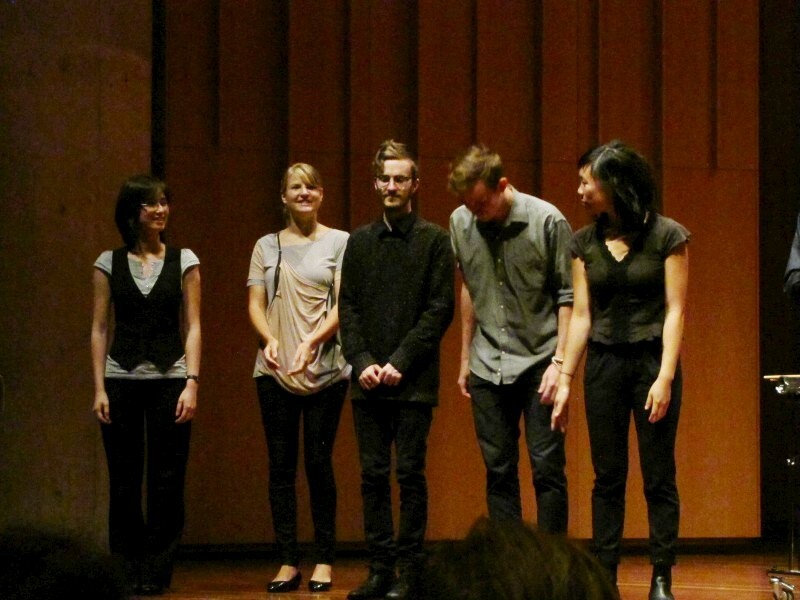 Ensemble Evolution is a trio based in Piteå, Sweden, but they are eminently international. 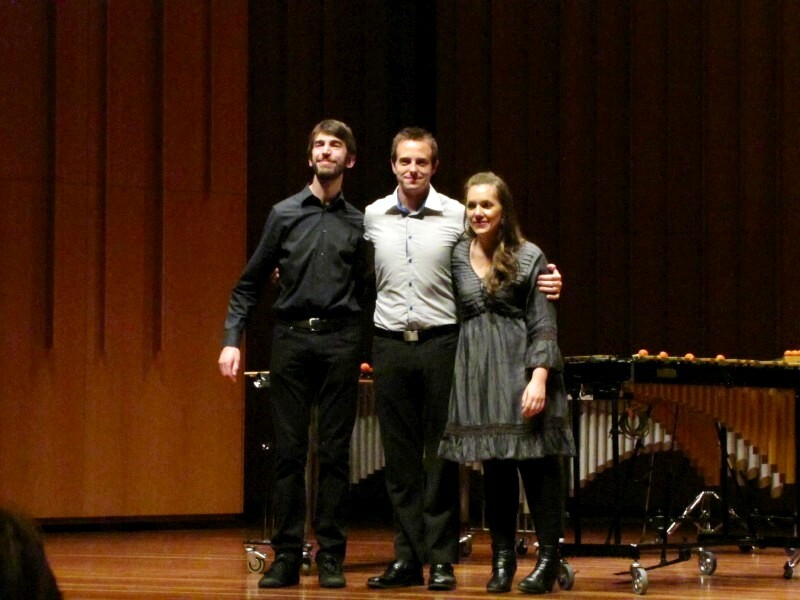 Charles Martin is a Canberra local, trained at the ANU; Maria Finkelmeier and Jacob Remington are from the US. 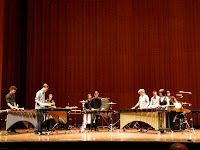 The trio performed their Solstormen program on marimba, vibraphone, electronics, cymbals and other percussion. 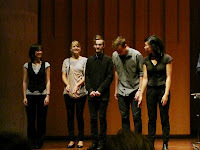 This was three works, joined as a medley, each composed by a different performer. Charles presented Taxi to Kalifax that records the long taxi journey to the nearest airport; Maria presented Dancing Lights drawing on the Aurora Borealis; Jacob provided Seven Forty-One describing lengthy band rehearsals over long, arctic nights. Surprisingly, I could hear the representations in each tune. The Taxi was groove-based and rolling and lively with what sounded to be jazz-like improvisations over a repeating chord structure. The Lights were meditative, mystical, gently polyrhythmic and rich with tones like swelling cymbals and bowed metals. The band practices were endless and repeating, sometimes quiet and slow and searching, other times excited and confident. All spot on. The sounds were the thud of timber from the marimba, then ringing metal of the vibes, the crashes of cymbals and the drone of electronics. Attractive and so accessible that I wondered if it was radio-ready. 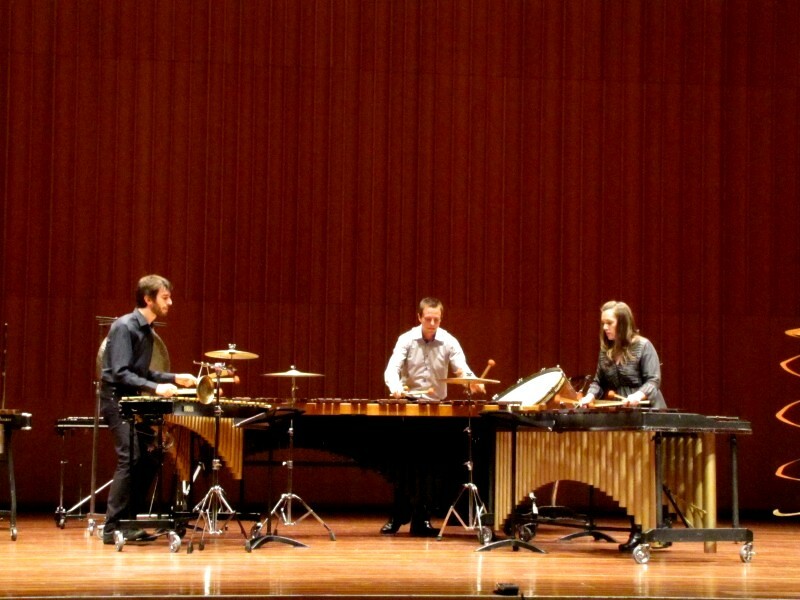 DRUMatiX joined Ensemble Evolution for a larger-scale piece that was less detailed in its composition, more flowing and less unexpected in arrangements, and obviously bigger in instrumentation. I thought I heard solos here too, along with richly busy rhythms which decayed to a tonal rubato that changed tone when Thai musicians cruised on stage and joined in with their Asian sensibility. 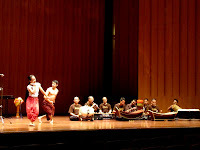 The sound changed mightily when the Thai Korphai Ensemble took over. 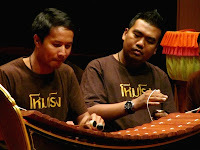 Their name means “bunch of bamboo” and they play traditional Thai (piphat) percussion music. 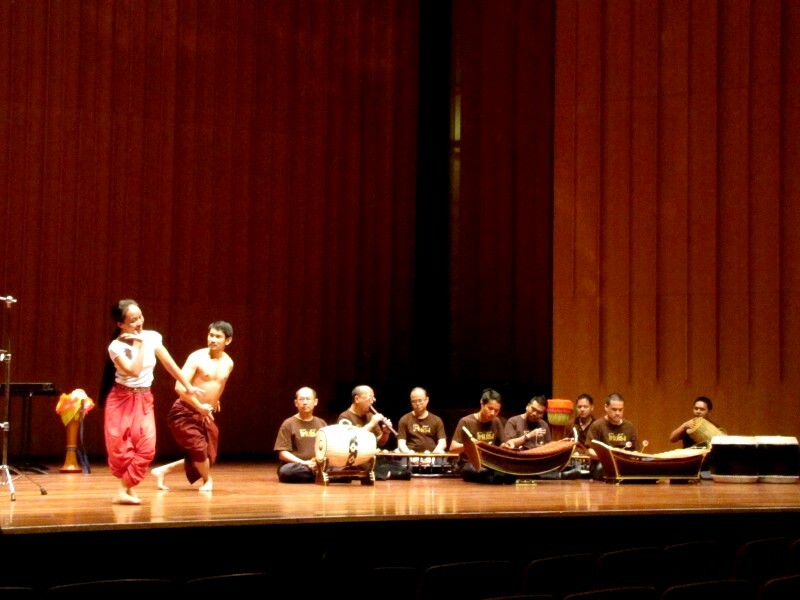 Korphai dates from the 1980s and is led by musical director Anant Narkkong, professor of ethnomusicology and composition at Silpakorn University, Thailand. This is Asian tonality. 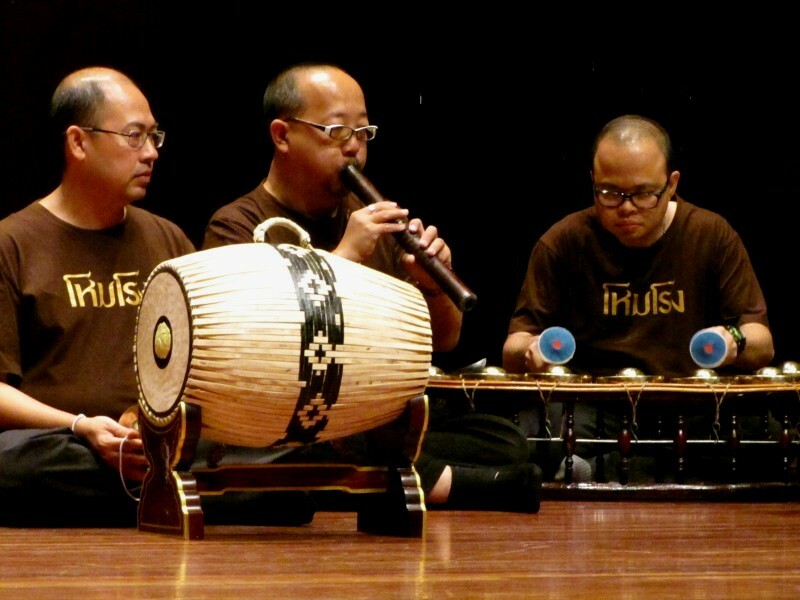 It’s strange to my ears; reminiscent of gamelan but not the same. It’s a ringing sound that seems to jiggle to my ears, as if it’s indefinite in pitch, but it’s most likely just non-tempered, non-European scales. But the whole conception is different from the West. This is not harmonic but melodic. Most of this melody is from tuned percussion, although there was also what seemed to be a short, stubby oboe, wooden with double reeds. The rhythms are simple and clear and unadorned and were layered with four-on-the-floor drums and regular sixteenth in melody. The pitch is high and bell-like, with just drums to offer a low end. And surprisingly, there were dancers that added to the pleasure and humanity of it all: a woman and a man, all bent limbs and splayed hands and a delightful sense of balance, dancing an obvious story of romance. Bodies flexible and arched and sensual like those famous ones from Hindu temples. Strange and uncommon to our senses but very beautiful in person. 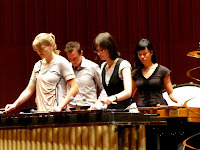 So as the musicians took the bows, then relaxed into playing each others’ instruments and an on-stage workshop, I took my bus back to work, enlivened by an international melange of percussion and driven by my trusty bus driver. How I like buses! Ensemble Evolution comprise percussionists Charles Martin, Maria Finkelmeier and Jacob Remington. 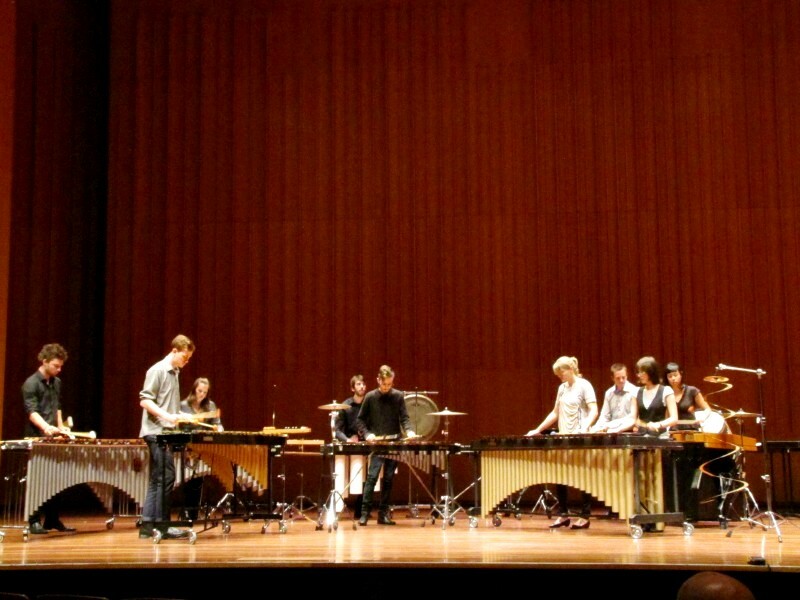 The DRUMatiX percussion group comprise Stephen Fitzgerald, Veronica Walshaw, William Jackson, Yvonne Lam, Bryce Leske, Bart Haddock, Jonathan Griffiths and are led by Artistic Director Gary France. Kor Phai is led by director Anant Narkkong.